Specific advice for administrators on constructing systems and procedures that give all our students the best chance for success. Just as teaching the students who challenge us is among our most frustrating experiences as educators, sticking with students until they finally "get it" is among our most rewarding. 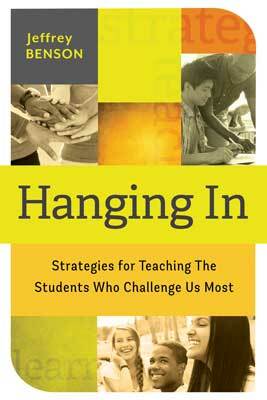 In Hanging In, you'll find the inspiration and field-tested ideas necessary to create a patient and supportive environment for even the most demanding cases in the classroom. "I wish I'd had access to this little volume during my own turbulent, uncertain days as a teacher and principal! What a valuable repertoire of inventive, helpful insights, ideas, and responses." "I found myself thinking as I read about the students, 'I know that student!' Jeffrey Benson catches the language of students who challenge us." "Just wonderful! Really impressive! I learned a lot!" "Just dynamite. Wonderful. I love so many things about it." "I know this book is meant for school people but I think it would be very useful for parents, both so they could understand how schools can help their children but also so they can learn to better hang in themselves." JEFFREY BENSON has worked in almost every school context in his 35 years of experience in education: as a teacher in elementary, middle, and high schools; as an instructor in undergraduate and graduate programs; as an administrator in day and residential schools. He has studied and worked side by side with national leaders in the fields of special education, learning theory, trauma and addiction, school reform, adult development, and conflict resolution. He has been a consultant to public and private schools, mentored teachers and principals in varied school settings, and has written on many school-based issues. The core of Jeffrey Benson’s work is in understanding how people learn, the starting point for everything that schools should do.